Did you know that Library and Archives Canada (LAC) has not only photos, books, paintings and manuscripts, but we also have a collection of digital material? Since we are the stewards of Canada’s documentary heritage, we need to make digital and analogue content available and usable. Imagine creating a WordPerfect file in 1996, saving it to a floppy disk and then trying to open it today. Three things could occur: 1) you might not have a floppy drive, 2) the floppy disk might not work anymore, or 3) you might not have the software to open the WordPerfect file. Now imagine this on a scale that includes thousands of different types of files created by federal government workers, private Canadian citizens, publishers, etc., and stored on many different kinds of systems, diskettes and computers. Floppy disks in the Published Heritage collection. Digital collections are inherently vulnerable to degradation and decay at a speed much faster than paper. To ensure the material lasts hundreds of years, digital preservation specialists must monitor and take action to prevent digital loss. These specialists monitor what types of file formats people are using (e.g., PDF, WPD), plan for changes in technology and create multiple copies, which are stored in climate-controlled vaults. We also make sure that the content of the files has not changed over time. Given how fast technology changes, we are always thinking ahead to prevent losing these treasured collections. 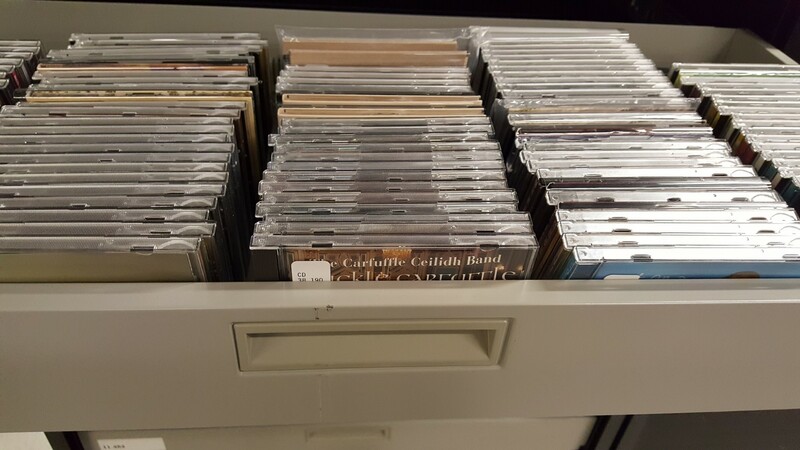 A small sample of the music CD collection, encompassing over 70,000 titles. For LAC, our digital crossroads is now. We are in an era where digital collections are surpassing analogue collections in size. 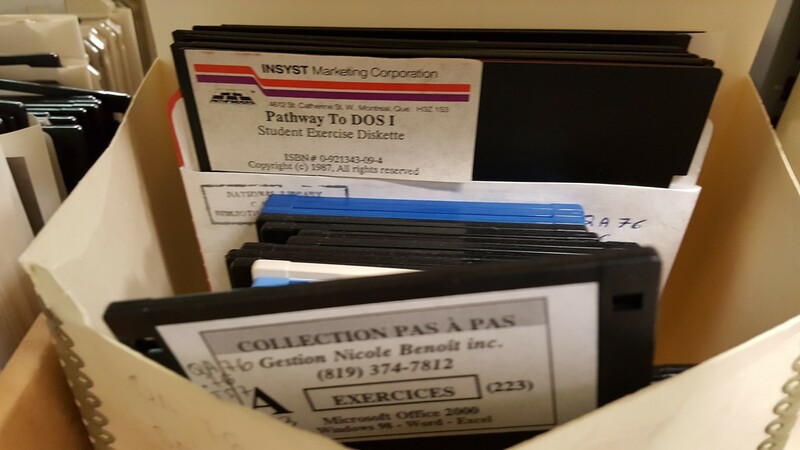 A recent inventory of our digital material revealed a vast and varied collection, both online and in physical media such as floppy disks, CDs and DVDs. This inventory also revealed that the volume of digital copies of university theses held at LAC is approaching that of analogue copies—and we only began acquiring theses in PDF digital formats in 1998. Since 2014, LAC has been acquiring theses in digital formats only. Official federal publications are also now primarily in digital format, since the government publishing regulations switched in 2013 to allowing online formats only. In addition, for the first time in its history, LAC received a private donation with 90 per cent of the collection in digital file format. 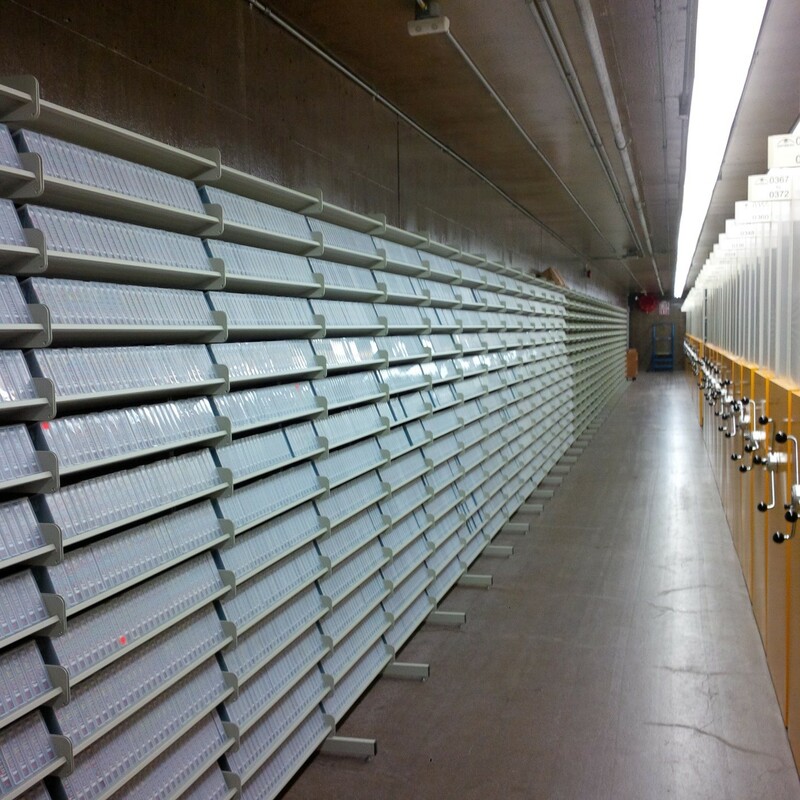 The LAC Digital Archive in the Preservation Centre serves as the central repository for LAC’s digital collections. Currently we preserve over five (5) petabytes of digital material, comprising primarily audiovisual material, the Government of Canada Web Archive, and digitized copies of paper records. Five petabytes of data would be equivalent to 1,338 metres (4,390 feet) of DVDs stacked on top of one another! Despite the considerable effort to preserve digital content today, we recognize that there is much more to be done to ensure all digital collections at LAC are protected. November 30, 2017, marks the first annual International Digital Preservation Day. As a member of the Digital Preservation Coalition, we celebrate this day by launching the Strategy for a Digital Preservation Program. This strategy describes the additional steps needed to further preserve LAC’s digital treasures for the future and ensure that we are on the right path to success. Linear Tape Open (LTO) tape library of digital documentary heritage that are preserved in the LAC Digital Archive at the Preservation Centre. Faye Lemay is a manager of digital preservation in the Digital Operations and Preservation Branch of Library and Archives Canada. The World Wide Web is the defining communications medium of our era, and a vital source of Canadian documentary heritage. At the same time, websites lack the durability of analogue materials and have a limited lifetime online. As the Truth and Reconciliation Commission of Canada (TRC) was coming to a close in late 2015, there was concern in the archival community that historically valuable information created on the web since the TRC’s 2008 inception could be lost. To meet this challenge, Library and Archives Canada (LAC) archivist Emily Monks-Leeson and LAC‘s web archiving team began preserving websites related to the TRC that were national in scope. We collaborated on the project with archivists at The University of Winnipeg and the University of Manitoba, who were at that time working on preserving TRC-related websites focused on the province of Manitoba. The result of this collaboration is the Truth and Reconciliation Commission Web Archive. Launched jointly with the National Centre for Truth and Reconciliation (NCTR), The University of Winnipeg and the University of Manitoba in July 2017, the TRC Web Archive provides public access to a spectrum of voices from the web related to the commission itself and, more broadly, to the theme of reconciliation. These include official TRC and NCTR websites and related documents, blogs and personal sites on the residential school system, media articles, and sites with a community focus on survivors, commemoration, healing and reconciliation. The websites in the collaborative TRC Web Archive were captured, described and made accessible through the Internet Archive’s Archive-It platform. To date, LAC has collected approximately 260 resources that, we believe, will be invaluable to researchers, students, survivors and their families, and anyone wanting to learn more about the TRC, its effects and legacy, and the responses to it from individuals, organizations, and media. âpihtawikosisân: Meaning “half-son”, this is the personal blog of Métis writer and educator Chelsea Vowel, who writes about education, aboriginal law, and the Cree language. 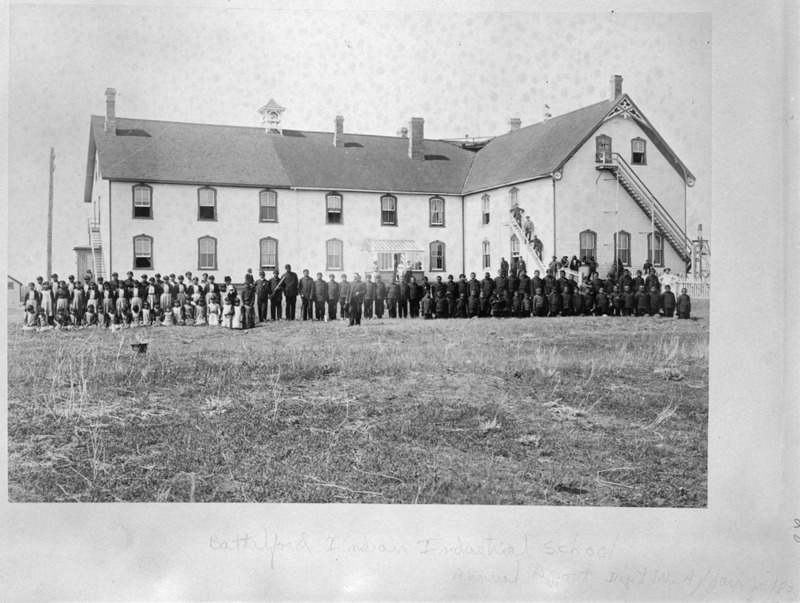 The archived blog includes observations on the legacy and public perception of residential schools. We Were So Far Away – The Inuit Experience of Residential Schools: A virtual exhibit that presents the stories of Inuit survivors of residential schools, providing moving examples of what life was like for students. “The Indian Residential Schools Truth and Reconciliation Commission” (Parliament of Canada): This paper by the Parliamentary Information and Research Service reviews the TRC‘s historical context, provides an overview of its terms of reference and its purpose, and discusses certain themes drawn from past truth commissions and other transitional justice initiatives conducted internationally. 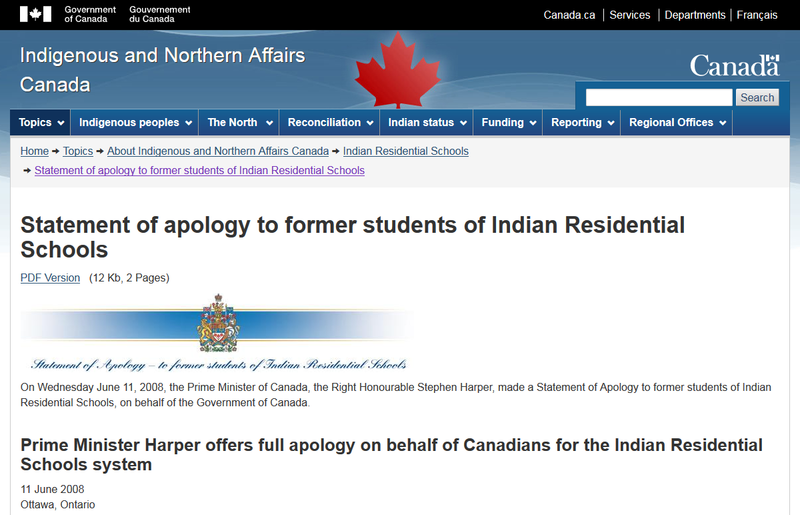 From the TRC Web Archive, Prime Minister Stephen Harper’s statement of apology to former students of Indian Residential Schools (June, 2008). The TRC, which began its work in 2008, spent six years collecting testimony from over 7,000 former students of Canada’s residential schools, in order to reveal the harmful legacy of the residential school system. The Commission concluded in December 2015 with the creation of the NCTR at the University of Manitoba and the release of the TRC final report, which included 94 calls to action for reconciliation and healing across Canada. View the archived TRC reports and calls to action from the NCTR website. The TRC Web Archive is an ongoing project, and we continue to add resources to it. In the course of our work, we were also inspired by TRC Call to Action #88—in support of Indigenous sport—to create a separate online archival collection focused on the 2017 North American Indigenous Games, held in Toronto with more than 5,000 participants from across North America. We welcome nominations from the public. If you know of a site related to the TRC, reconciliation, or Indigenous issues more broadly that would enhance our collections, please send an email to LAC’s web archiving team at bac.archivesweb-webarchives.lac@canada.ca, and we’ll assess it for preservation. Library and Archives Canada sincerely hopes that the TRC Web Archive adequately preserves the history and legacy of the Truth and Reconciliation Commission as a respectful and sensitive documentary and research resource.